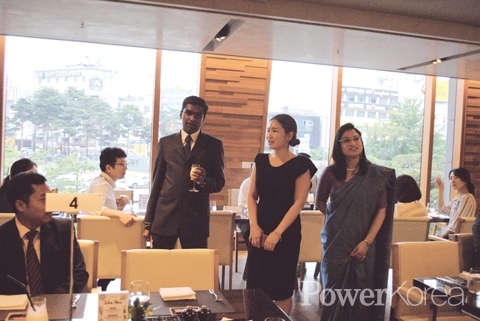 The Embassy of India in Seoul held an Indian mango promotion dinner on 27th June at the JW Marriott Hotel, Dongdemoon in Seoul. Over fifty guests from cross-section of Korean society, including major chain stores, wholesalers and buyers, importers and food critiques as well as reporters were invited to the event on the day to have a chance to taste the ultimate taste of Indian Mangoes. Guests were treated with a variety of savory items made of Indian mangoes, including canapes, tarts, pastries and juices. India is the home of Mango. The fruit was first found 5,000 years ago in the region called ‘Mangkay’ from which the name ‘mango’ derived. More than 1,000 kinds of Indian mangoes are available today and 50 countries including the US, the UK, Canada, Germany, France and New Zealand are importing Indian mangoes. Indian mangoes are known to be sweet, pulpy and aromatic and the Korean supermarket chain e-mart started to import Indian mangoes from last year to give Korean consumers the pleasure of tasting these exotic fruits. Keshar and Badami varieties were introduced this year which you are highly recommended to try. A special mango promotion event was held with the Ambassador of India Mr Vikram Doraiswami on 15th June at the e-mart Seongsu and the tasting event took place at 15 e-mart stores nationwide on 16th, 17th and 22nd the same month. The Indian Embassy said that they would continue the promotion of Indian fruits in Korea and introduce excellence of Indian fruit varieties.